BOB MARLEY Survival (Super Rare & Original October 1979 UK promotional poster measuring 37" x 24", issued to advertise the album 'Survival' which was released on the 2nd of October 1979 through the Tuff Gong label. This incredible design layout was put together by Neville Garrick & Brad Kanawyer, with a centred black & white photograph image of Bob Marley taken by Adrian Booth next to a quote from the song 'Africa Unite'. This righteous image is surrounded by a border of 52 Africanstate flags with a footnote for each one, with the 53rd left blank for the possible inclusion of Zimbabwe. The song 'Zimbabwe' from the album was dedicated to later independent Rhodesia & was performed at Zimbabwe's independence celebration in 1980. This exceptionally rare & desirable original poster is in Excellent condition & remains unused without pin or staple holes, unbacked with no rips or tears or writing & merely the lightest few signs of handling at the corners, stored rolled & one of its kind). 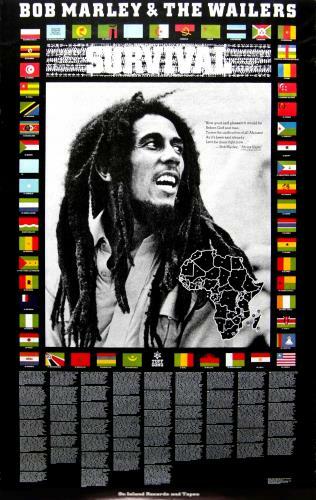 or visit our Bob Marley image gallery.